It's been almost two months since I blogged from the perspective of the object being mended. In Surrender To The Mender I was the coat letting go and receiving "quality garment care" from the hands of the mender. Since that time I have been living receptively. Patiently waiting for circumstances to unfold. I haven't taken a stitch towards actually mending my real coat. It's still hanging in the studio. Now it's time to see again through the eyes of the mender. Creative mending requires the quality of being able to grasp and comprehend what is obscure. As the mender my role is to listen to the coat, and be guided by its need of repair and want of fashion. I can say that the coat will be worn again with satisfaction but I can't tell you what it will look like. The coat and the mender are on a sojourn through the wilderness together. 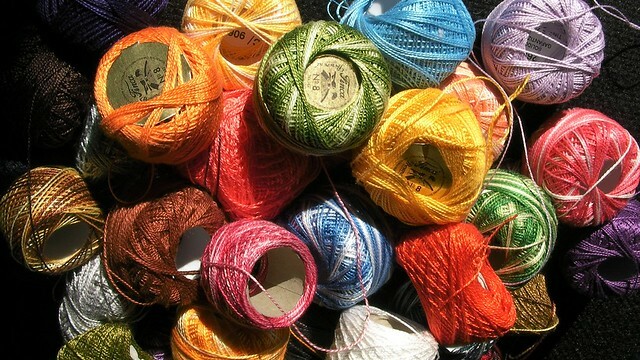 Perhaps a wilderness of colorful thread and too many choices. To address my personal wilderness, I’ve been meeting weekly with a discernment group consisting of five very wise women. Their role is to ask me questions. Help me discover the pillar of fire and the cloud of cover that will lead me through this transition. Last week they blessed my hands, this week my heart. This is the third post of the series on Mending My Paris Coat. What is the pillar of fire that guides you through dark times, or the cloud of cover that allows you to escape from your captors? How do you apply discernment in your creative process?